I can't wait to peruse the links this week.... PLEASE make sure that you link back to one (or all) of us, grab our graphic and blog about your FAVORITES this week! Another favorite???? The piggies :) They're more of a necessity, rather than a fashion statement - since her hair is CONSTANTLY in her eyes and she refuses to wear clippies. The cnevron and polka dot fabrics are metallic gold - SWOON!!! If you're looking for something extra special and cute for the upcoming holidays, be sure to check out her adorable work! How AWESOME is this monogrammed, burlap tree skirt?!?!?! It's also from Moon Pie Design and she's graciously offered to give one of y'all a custom burlap tree skirt! I'll pick the winner and announce next Thursday!!! My next FAVORITE has been seeing all the #mandastrong pics on Instagram this week! The shirt sale is open for about another week, so if you haven't snagged your shirt to support Manda and her family yet, be sure to check out her booster page to place your order! One of my very FAVORITE people EVER is about to bring her daughter home and our group of girls couldn't let the occasion pass without showering Miss Ashby with some love (and adorable presents!) If you know me at all, you know my heart is in the details and working on some fun little "projects" for the evening was one of my FAVORITE moments of the week. I posted a video of Mason and GG singing their ABCs on Instagram earlier this week, and several people commented about the toy all of my kids were playing with. It's a FAVORITE at our house and you can find it HERE. We've had it for years and LOVE it! FOR THOSE WHO ASKED.... YOU CAN FIND THE ALL IS BRIGHT SHIRT HERE!!! Oh my gosh, your tortellini soup...I made it a couple weeks ago and it was SOOOO GOOD!! I might have to whip up a batch this weekend too! Seriously.....Gwippin is my favorite little ....She is stinking adorable and as a mom of 25 and 22 yr old daughters....I miss this age! Your children are adorable!! Happy Friday! The owl shirt is adorable and the fabric choices are perfect for fall. Have a fun filled weekend! love reading your blog. You give me Many fun, inspiring ideas! I love all the things you create for your kiddos. My kiddos love when they have surprises waiting for them after school...and we love crafting and decorating for the holidays!! Its the little things, right!? I love that burlap tree skirt! the tree skirt is so cute! thanks. 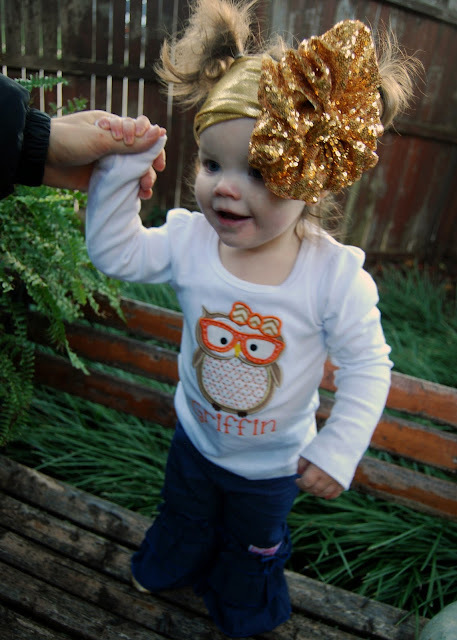 I love Griffin's owl tee, I love this cold weather and I looooove how excited you are for my sweet girl to come home! I just know she and G will be BFF! Love love love that tree skirt and Griffin's shirt! So cute! Love that tree skirt and your blog! Luke's graph is my FAVE. That is hilarious!!! Oooh, I have been wanting a new tree skirt! Thanks for hosting such a fun giveaway! I would love to win that darling tree skirt! Good luck flying solo this weekend! I'm sure you'll be great! Love Griffins outfit!!! Too cute! Wish it came in my size! I enjoy your favorite things posts! Where are those adorable sparkly envelopes from? 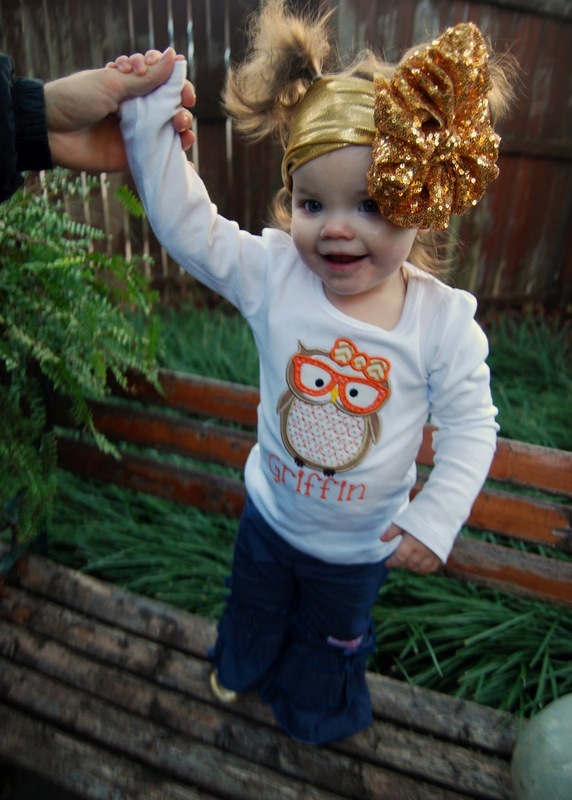 Your daughter looks adorable in her owl shirt! I love that monogram tree skirt! Thanks for hosting the giveaway! Fingers crossed! Love the darling burlap tree skirt! Love those headbands - wish my girls were still young enough to wear them! Happy Friday! Love Griffin's shirt and the tree skirt! 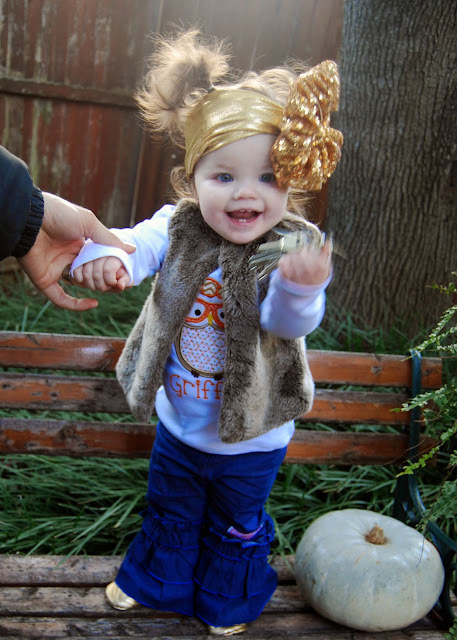 Ok FIRST of all-I am dying over that little jacket and G's owl shirt! We over here in the land of all things monogramed will have to look into getting some cute T's from Moon Pie!! SECOND- LOVE that tree skirt! THIRD-I'll totally join you in the dressing for Christmas early! Love that monogrammed treee skirt! Thanks for sharing all of these goodies! What a fun giveaway! I need a new tree skirt, and this one is too cute! 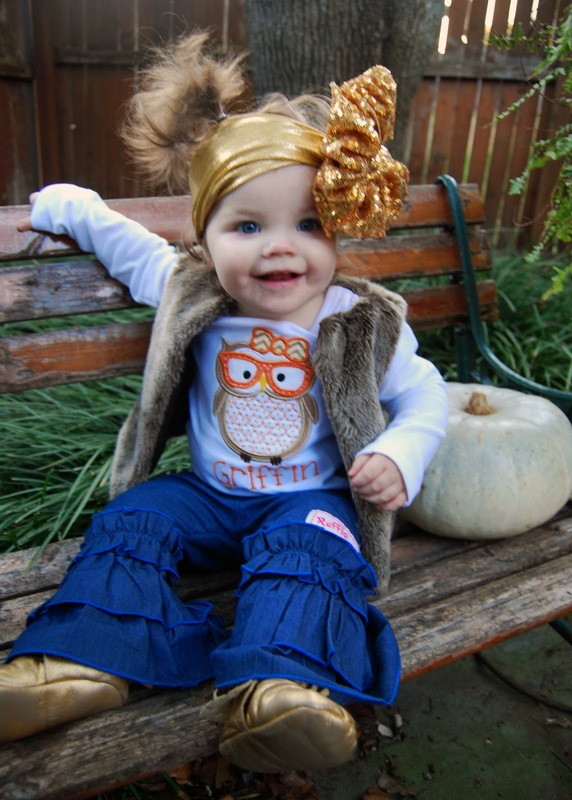 That mini fur vest on your little one is absolutely adorable too! Have a great weekend! Love reading your blog! The tree skirt is awesome! That owl shirt and vest are just perfect! Sooo cute. (: I love this tree skirt. each year I try to redo my Christmas Decorations theme and this would be perfect for a "Country Christmas" theme! (: Usually I get the ball rolling around the middle of November and then up the decorations go! I love linking up with you and your friends on Fridays and always enjoy reading your blog!!! Griffin's pig tails are too cute! It finally turned cold here in eastern N.C. and I also am excited about bundling up and warming up by the fire. You are so right.. if any child needs that jacket it is Shay's child! Love it! I love all of the glitter details that you did for the mini-shower. We just had my sister's bridal shower & we did black with gold. It was so much fun to add all of that sparkle! That tree skirt is darling!!!! That burlap skirt would be precious under my tree! I just love reading your blog. Love love love the owl shirt, so cute! Would love the tree skirt, our old one got was thrown out, so that is on the to buy list this year! I just love visiting your blog. You bring so much joyful nostalgia to my day. My littles are not so little anymore, two in college and two off at boarding school. Thanks for letting me relive some of those precious memories! Oh and yes thanks for the Baked Potatoe Recipe, a new favorite! YUMMY! That' tree skirt is so cute!!! Also, I love Griffin's owl tee! So cute!! Love love the tree skirt! Ohhhhhh I'm LOVING Moon Pie Designs! Your little girl's outfit is adorable!! And that tree skirt!!!! That tree skirt... Love!! And I made your tortellini soup last night... my husband LOVES it!! Happy Friday! Loved so many things about this post but burlap with a monogram is one of my fav combos!! You are such a sweet friend to Shay! Such a cute tree skirt!! So I'm in love with the tree skirt. Love the tree skirt and love your blog! What a cute owl shirt. I love the tree skirt! Such a cute tree skirt and the little owl shirt is the sweetest thing ever! I cannot stop laughing at Luke's chart!!! I'm loving that tree skirt!! oh my goodness .. those headbands are adorable! I love Griffin's owl tee. I'm a sucker for anything with a monogram!! I love that tree skirt and I am in the market for a new one, perfect...Thank you! I keep saying that one of these days I am going to join in on this fun link-up but I just haven't found the time to yet. I work full-time just like you but I am on the computer all day. LOL I saved that toy to my wishlist. I've already bought most of my kid's Christmas stuff this week but this may have to be our game present this year. I always try to buy at least one family game and this would be fun to do together. Thanks for sharing and love that your hubby always texts you. I should really start doing that for my hubby since he leaves for work before the kids get up. He would really enjoy it though. Good luck on flying solo. I totally get that. My hubby is hunting this Saturday and I will likely be solo that day too. Such a cute tree skirt! That burlap tree skirt is so cute! And I love all the Ruby wrap headbands!!! I wish my 9 month old would keep any bow on her head!! Such a sweet blog! Tks for giveaway!!! Luke's chart.....LOVE IT! What a smart kiddo. I love burlap and anything monogramed. So that tree skirt is to die for. Happy Friday! I love your blog and love that tree skirt!! Gah that owl shirt. SO CUTE!!!!!!!!!!!!!!!!!! Griffin is adorbs as usual! Loving the tree skirt! Happy Holidays!!! Love the tree skirt! That tree skirt is ADORABLE! As are your kiddos. :) Happy Friday! I LOVE that tree skirt! So cute! GG's owl shirt is adorable! Actually her whole outfit is :) And I just love that burlap tree skirt! Love that tree skirt...it is precious! Your little family is just delightful! That tree skirt is adorable! HAHAHAHA....was my reaction to seeing sweet Griffin this morning! That girl...she has it going on and she is a constant source of smiles for me!! You dress all of your kids SOOOO cute and I truly love that you let them be their true selves!! The memories that you are creating for your family will last a lifetime!! You go way beyond the extra mile for your family! You are a wonderful mom!!! 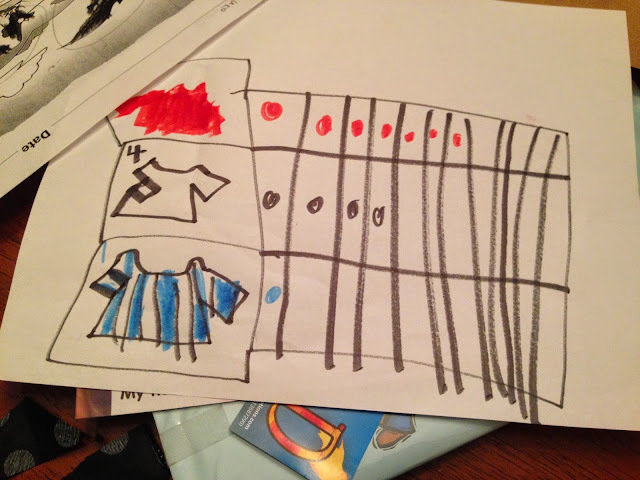 Hello Andrea, I recently started following your blog and love seeing Griffins wardrobe. I'm a MJ girl myself. Love the burlap tree skirt! I'm ordering that All is Bright shirt!! I love your blog such a sweet little family and that tree skirt is super cute! Love that 1st outfit! Such a cutie! Love the tree skirt! My husband hates our current one so a new one would be awesome! 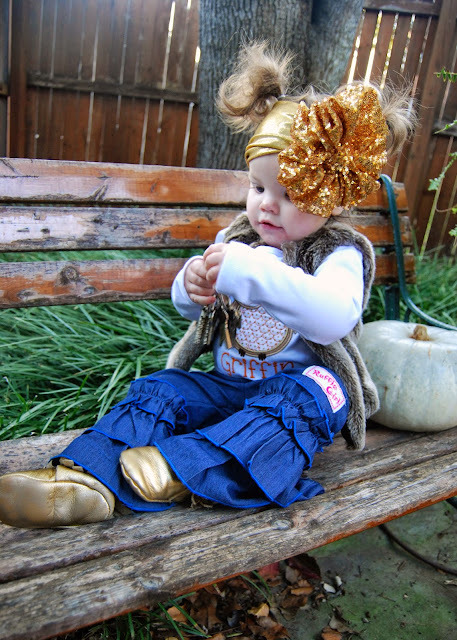 Love the burlap skirt and your kids are adorable!!! Love that owl shirt!! And that monogram burlap tree skirt is precious! This Kari NEEDS a M burlap tree skirt before my Christmas party on the 20th!!! That tree skirt is perfection!!!!! omg I would love to have that tree skirt love me some burlap! If only I had your enjoy & creativity! Love the free skirt. Love love your blog!! First time checking out her blog. Will be a regular checker! Love this tree skirt...I'm all about burlap! Love your blog and I really love the tree skirt! Have a blessed day! I enjoy your blog & love the monogrammed tree skirt! The tree skirt is gorgeous! Griffin's shirt is so stinkin' cute! Love your tree skirt, too! I'm loving Griffin's owl tee and those piggies! Too stinkin cute! :) Speaking of cute, that monogrammed burlap tree skirt is also really cute! Oooh I would love that tree skirt! Lovin' that tree skirt and all the gold glitter going on at the party for Ashby! Griffin is so cute! Fun giveaway-thanks!!! Love the tree skirt and would love to win! I also really enjoy reading Friday Favorites! Love that burlap tree skirt! I love that burlap skirt! but really! That tree skirt is adorable!! Griffin's shirt is adorable and also love the burlap tree skirt. I would love to win! 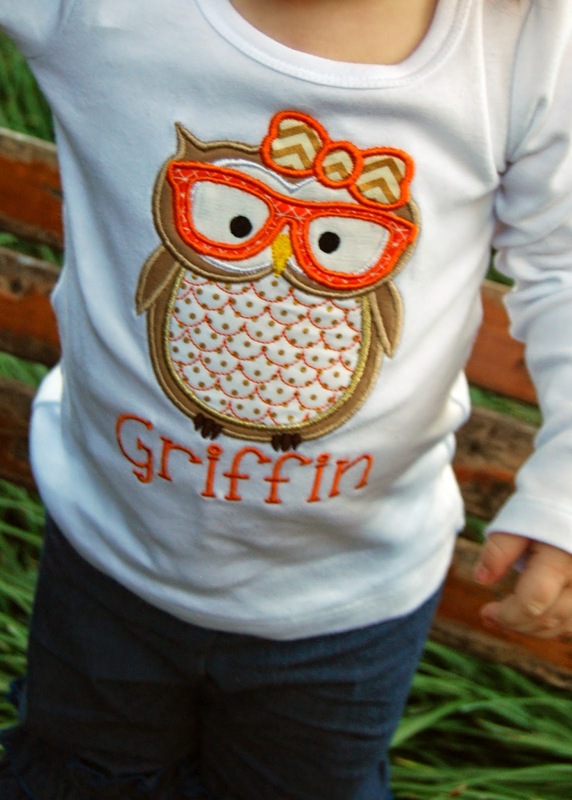 I love all things personalized! Love reading your blog! Christmas is my favorite! Love that tree skirt! Weren't you such a happy "math" mom to see your child graphing?!? How funny!! :) Definitely an artifact to place in the "keepsake box!" Haha and I love the tree skirt!! #adorable! Thank you for hosting, as always. Am LOVING the tree skirt- so cute! I would love that tree skirt under my tree ❤️ Amy K.
The tree skirt is super cute! Look forward to reading your blog every day, your kiddos are so cute! I love that tree skirt! I'm also from north Texas and oh my goodness it's cold! Have a great weekend and stay warm! I love the tree skirt! I want to buy it now instead of waiting to see if I win! Love your blog..Love the tree skirt!! Hope to win..I need a new one!! Love your blog and love that tree skirt! 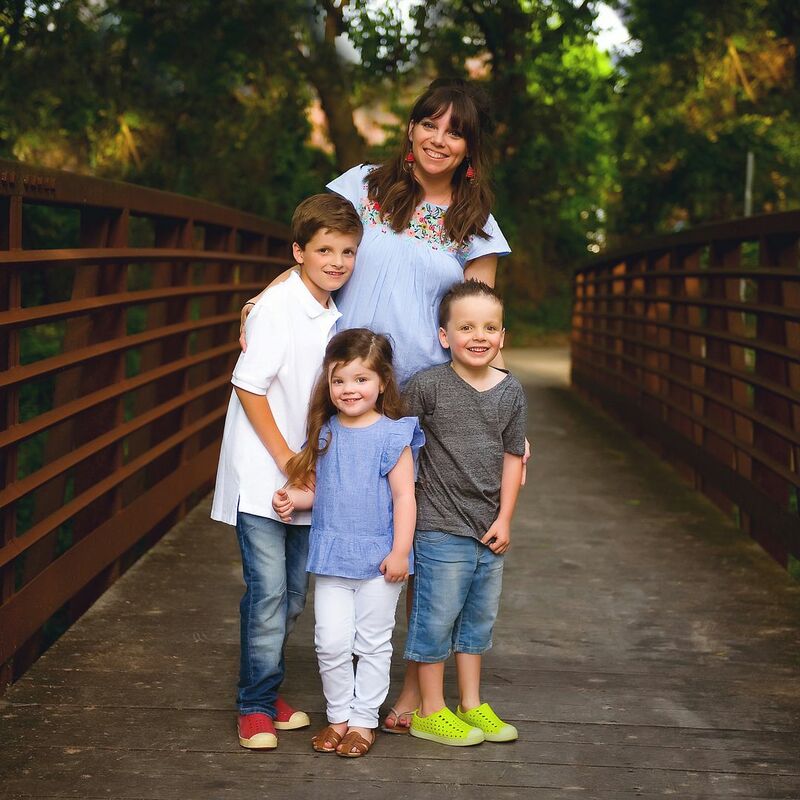 I'm a teacher from Georgia with two little boys and stumbled upon your blog. Love it! Love your post, as always. Have a great weekend!! I love all the sweet things you posted from this week...the piggies, the owl shirt, the after school pics, the graph Luke made (he is your child-ha!)...etc. You are so fun and bring a smile to my face every time I read your blog. Love this tree skirt. I would love to have this!! I love your blog!!! I don't have a blog, but enjoy reading your blog so much. You mentioned in one of your posts about some latch puzzles or something like that. Would you mind telling me what they are called and do you get them off of Amazon or is there a place with better prices? Would love to order my GRANDchildren some. And also, what month did you do the arm candy party? I am wanting to order my daughters some. You are helping me out with my Christmas list so much. Thank you!!! Have a blessed week! Love the tree skirt..we def need a new one, we've had our flimsy one for 11 years!! Love that tree skirt. It would be perfect under my tree! It's so nice to have someone else find all of the cute things for me - I say as I sit her in my Toms Desert Wedge booties, my blardigan & my must-have scarf (layered with another for more volume, naturally). Love that tree skirt! Thanks for the giveaway...and your daughter is adorable! That tree skirt is adorable! I love seeing your little girl all dressed up! Thanks for sharing her facebook page. I just called and ordered my tree skirt. Can't wait to get mine!!! I need a new tree skirt!! that one is SO cute! I love this tree skirt!! I would love a new tree skirt and this one is super cute!! Your baby girl is delicious! Precious! I love GG's hair in pigtails so much!